The 2014 Pinot Noir opens on a complex nose combining earthy and savoury spices, pipe tobacco and sweet vegetal notes with lots of ripe black cherry, strawberry and raspberry fruit. There is even a hint of game meat, nut, vanilla and some orange zest. The palate is rich and silky with crisp acidity and lots of bright raspberry and strawberry, dried blueberry, pepper, clove spice, cocoa and a hint of dried sage on the long finish. Try this with a North African influenced lamb stew or red wine and thyme flavoured sausages. Rhys Pender, Master of Wine. The 2014 season presented the ideal profile for the production of intensely aromatic and concentrated wines for both whites and reds: the dry and warm Spring favored blossoming, exceptional levels of heat during summer time provided for sufficient energy for an even ripening and the beautiful late season gave us time to pick the grapes at will, when they had reached our optimum standards of maturity. 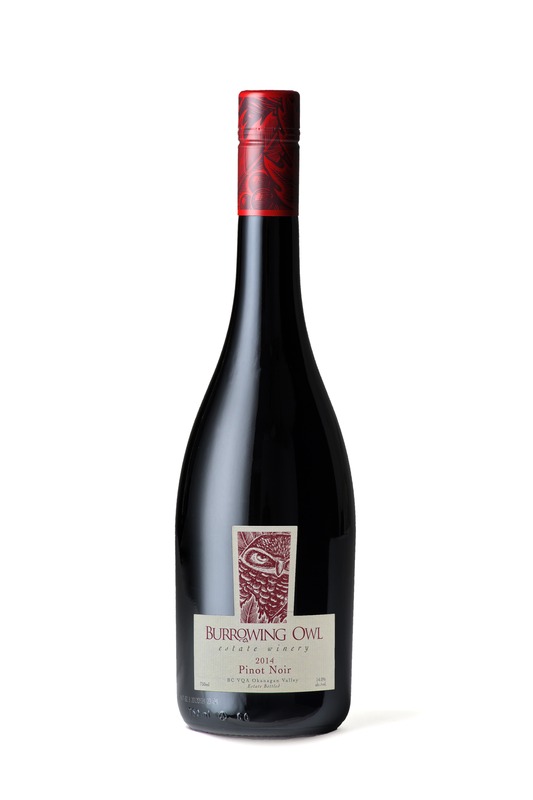 The grapes were handpicked from Burrowing Owl’s Vineyard in Oliver on September 27th and October 8th 2014. They were hand-sorted, destemmed and slightly crushed before being dropped into stainless steel tanks. The “must” (juice + skins + seeds) was cold soaked for 2 days prior to fermentation for a moderate extraction. Strict temperature-controlled fermentation (15-26 Celsius) helped retain the Pinot Noir’s delicate flavours. The wine was then pressed and transferred into barrels for malolactic conversion and ageing. The ageing program, based on French with a touch of American oak enhances aromatics while adding toasted and spicy notes. During ageing, the wine was regularly racked off its lees; it was then bottled unfiltered.